This research is a part of a diagnostic work that was carried out on Palazzo Marchesi D'Amico of Milazzo in Sicily. The results of the diagnosis are now going to be used as base for the conservation project. Aim of this work is to find correlation between the results of ultrasonic measurements obtained on two columns of the palace and the mechanical characteristics of constructional materials, taking also into account their anisotropy, in order to obtain information on the mechanical behaviour of the two columns in a non destructive way. The constituent materials of the columns are sandstone, of a type called in Sicily "arenaria". The material was analysed by means of the following analytical techniques: X Ray Diffraction, observation of cross sections under the optical microscope, analysis at the Scanning Electron Microscope. Longitudinal velocity at the frequency of 50 KHz was measured on three sections at different heights of the two columns. A tomography analysis was done on a section of a column. Since it was not possible to take sample from the columns to carry out the mechanical testing, were founded a cave from which was token three different blocks of arenaria that was similar, but non equal of course with respect the material of the columns. The difference was detected both by ultrasonic measurements and by petrographycal observations. Compression mechanical tests have been performed on the material of the cave and static and dynamic modules (obtained at 1 MHz) were compared. This study is devote to set up a suitable methodology for studying the mechanical behaviour of the material of the analysed particular of the monument, to apply when it is not possible to carry out mechanical testing directly on the same material and to optimise the number of tests on the same material, considering the low availability of materials in the conservation activities. Aim of this work is to find correlation between the results of ultrasonic measurements obtained on two columns of D'Amico Palace of Milazzo and the mechanical characteristics of constructional materials, taking also into account their anisotropy, in order to obtain information on the mechanical behaviour of the two columns in a non destructive way. All the analyses, when it was possible, have been carried out making reference to the Italian National Standards (UNI-NORMAL). Ultrasonic measurements were performed in situ on two columns of Palazzo d'Amico of Milazzo (called A and B) at three different highs: 35, 100, 200 cm as shown in Fig.1. The frequency used for the longitudinal velocity measurements were 50 KHz, in transmission mode, by using a pulse generator SIRIO RP 4000 CSM. For the ultrasonic measurements was made reference to the NORMAL 22/86 standard . The measure points are showed in Fig. 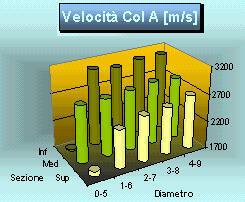 1, for each velocity measure were taken opposite points on the column. Data acquisition was made by means of a home-made software. Accuracy of the measurements is estimated as 2% of the measured longitudinal velocity. The tomographic reconstruction was realised on the column B. The considered section was at 100 cm from the column top. The paths considered are reported in Fig. 2. The measurements were performed with the same instruments of the par. 2.2. For the tomographic reconstruction was used an home made software called Tomo 2.0 . Tests have been carried on 6 samples obtained from quarry blocks of similar material (arenaria stone) as shown in the petrographic analysis (par. 2.1), cutted in cubes (5 cm edge), taking into account the cut direction (Fig.3). Velocity measurement were performed at a frequency of 1 MHz, in transmission mode, by using a pulse receiver Panametrics 5601A/ST and an oscilloscope Philips PM3323. Both the longitudinal (Vl) and shear velocity (Vt) were measured in the three directions. Reference was made to the NORMAL 22/86 standard . Before the compression mechanical tests was also measured the longitudinal velocity at the frequency of 50 KHz with the SIRIO instrument on 13 cylindrical samples (141mm high and with a diameter of 73,5 mm) placing the ultrasonic probes on the two opposite faces of the sample, parallel to the direction of the applied load. Compression mechanical tests was carried out by means of an Instron 4507 apparatus, making reference to the ASTM standard  and to the UNI 9724, on the same 13 cylindrical samples of Areanaria stone used for NDT. The samples were grinding with a 100 m diamond paste and, in order to follow the real deformation due to the increasing load, four strain-gauges have been applied around the specimen at 90° each other, perpendicularly to the direction of the load applied. The test was performed by small increase in load (0.5 Mpa) till the ultimate compressive value was reached. The elastic static modulus was also measured. 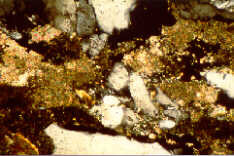 Petrographycal observations shows that the sample PDAC 1 is mainly made of quartz; the presence of abundant feldspars of quantity, crumbs and chlorites.The fragment has a total porosity media, varying among the 24, 6% and the 27, 8%; the chemical analysis validation, the eminently silicate nature of the fragment, showing the shortage of the natural cement, it has clayey and carbonat among the granules. Samples PDAC 2 and PDAC 3 have also a quite mineralogical-petrography characteristic with a prevalence of quartz, presence of abundant feldspathic quantity (orthoclase and plagioclases) with cement quartz. The porosimetric analysis do not also show great variations between PDAC 2 and PDAC. 3, in fact the values are understands among 19% and 22%. 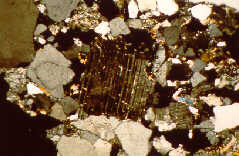 The sample show a grey-clear coloration and an enough elevated porosity; considering the silic fraction-clastic and the carbonatic granule number, the rock it may define a " quartzoarenite or protoquarzite" Fig 3. Mineralogical is constituted from quartz crystals, alkaline feldspar, plagioclase, muscovite, biotite, chlorite, clayey mineral and rock fragment. In some point is possible to observe little quantity of chalk, perhaps added to animal glue from as it is suggests by the inclusion of least quantity of protein substance. 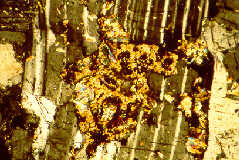 Fig 3: PDAC 1 - thin section, Nx, 25x. Fig 4: PDAC 2 - thin section, Nx, 25x. Fig 5: PDAC 3 - thin section, Nx, 25x. The section in examination is an arenaria sandstone type " arcosic", containing an elevated percentage of granules detritus of alkaline feldspars (orthoclase and microcline) Fig. 4. The orthoclase crystals, are easily sensitive in the decay and in more accentuated manner in comparison with the quartz is often underline turbid. The feldspars are represented from orthoclase, microcline and sodic plagioclases (albite and oligoclase). The sample PDAC 3 is similar to the sample PDAC 2. From the mineralogical point o f view. It is constituted from coherent material to clastic weaving, but with a decidedly coarse nuisance, with granules to angular to round off, cement primarily quarztic, with some calcitic points. Considering the silic-clastic fraction and the number of carbonatic granules, the rock may be definite an arcosic, giving also the contain of feldspars superior to the 50%, Fig. 5. 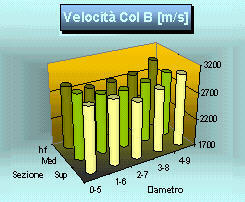 The values of the longitudinal velocity measured on the column A and B at three different highs are reported respectively in Figs 6 and 7. It is possible to note as the longitudinal velocity in column B is more uniform at the three different highs then column A. On column B was carried on a tomographic reconstruction of a section of the column to verify that the velocity map was really well distribuited. The tomographic reconstruction is showed in Fig. 8. 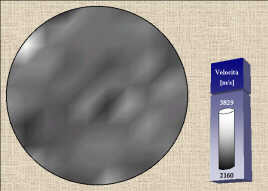 At darker areas correspond the lower ultrasonic velocities. It can be observed that the velocity map is well distributed. The higher velocities of the longitudinal waves in the Z direction point out an anisotropy of the material. The shear ones seem to be less affected by an anisotropic behaviour. The first number which is indicated on the sample represents the carry block from which was extracted the cylindrical samples. In the Table 2 the symbol * it means that the samples were obtained from the same curry block, but in the perpendicular direction with respect to the other. Compression test has been carried out on the same 13 cylindrical samples of the ultrasonic measurements. Values of the compressive strength (s ) and of the Stalic Elastic modulus (Estat) are reported in Table 3. Table 3: Results of the compressive mechanical testing. (*) it means that the samples were obtained from the curry block in the perpendicular direction with respect to the other. Rx =Vt/Vl= 0.7, Ry=0.7, Rz=0.65. Considering the ratio value as 0.7 between the shear and longitudinal velocity, it was multiplied for the longitudinal velocity obtained on cylindrical samples in order to calculate the elastic dynamic modulus on the cylindrical samples following the formulas (1). The calculated values are reported in Table 4. Correlation diagram between the Dynamic Elastic Modulus (Edyn) calculated by means of non-destructive testing and the Static Elastic Modulus (Estat) measured by mechanical testing are shown in Fig.9, the estimated error was of 5%. The ratio between Estat and Edyn is estimated by a linear fit as 1,1. The correlation coefficient value is 0.97. It is quite similar to the correlation coefficient measured on rocks in laboratory measurements by other authors , that results approximately 0.99, and it is higher then the value (0.91) obtained in an other our paper . This result, obtained as a result of correlation between in situ and in laboratory tests, can be methodologically used for other in situ measurements in order to get information in a non destructive way on the mechanical properties of monuments stones. In this way, it is possible to correlate the longitudinal velocity measured on the two columns in situ with the mechanical measurements obtained in laboratory. In particular it is important to note that the longitudinal velocity measured on the cylindrical samples it is lower then the longitudinal velocity measured on the two columns, then it can be considered that also the E static modulus of the two columns is higher then that measured on the cylindrical samples in laboratory. This kind of information is very useful for who project the restoration of the palace. Our investigation was devoted to find a correlation between the results of ultrasonic measurements obtained on two columns of D'Amico Palace of Milazzo and the mechanical characteristics of constructional materials, taking also into account their anisotropy, in order to obtain information on the mechanical behaviour of the two columns in a non destructive way. The results were compared and the correlation was good. The used methodology provided results that were significantly comparable with those obtained by the mechanical static method. These results can be considered useful data to get important information in a non destructive way on the mechanical properties of stone monuments and the used methodology can be extended to other study cases. The authors would like to thank Ing. Pierpaolo Mincarone of ISBEM Institue for the elaboration of the tomography software. Doc. NORMAL 22/86 (1986) - Misura della velocitא di propagazione del suono, C.N.R.-I.C.R., Roma. Krautkramer (1977) - Ultrasonic testing of materials, Second edition, Springer-Verlag, p.580. B. Christaras B., Auger F., Mosse E. (1994) - Determination of the moduli of elasticity of rocks. Comparison of the ultrasonic velocity and mechanical resonance frequency methods with direct static methods, Materials and structures, 27, 222-228.